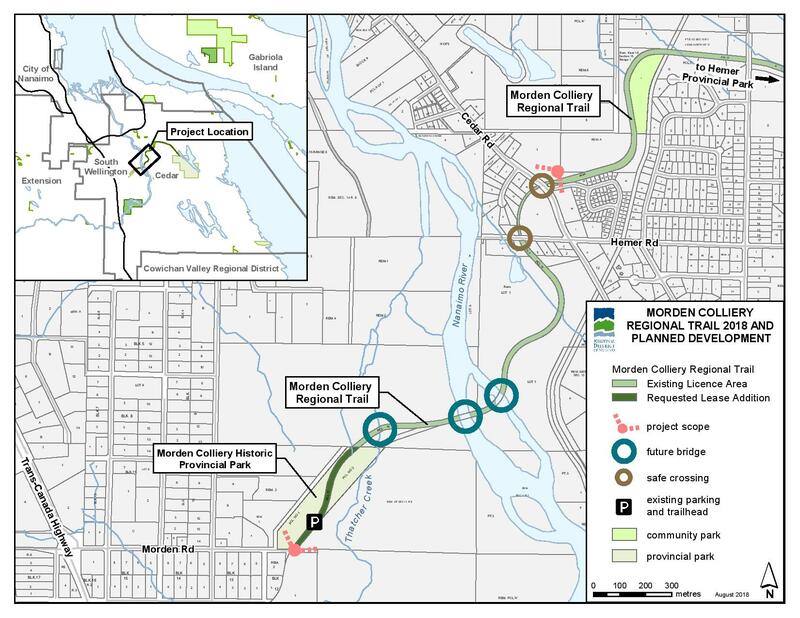 The RDN continues to pursue a recreational bridge over the Nanaimo River and connection of existing east and west stretches of developed Morden Colliery Regional Trail (MCRT). A Nanaimo River crossing will form the centre piece of a completed mid-section of the MCRT between the river and Cedar Road. Following an open house on the project in late 2015, the Regional Board confirmed that the river crossing and trail should accommodate pedestrians, cyclists, equestrians and those using medical mobility aids. An application is with the Province to see the Region’s tenure over the Crown-owned MCRT changed from non-exclusive Licence of Occupation to lease. In 2018, the Agricultural Land Commission provided the RDN with conditions for trail development along the public corridor. Detailed planning work to support completion of proposed development will get underway in 2019. Project Location Map. Click to enlarge.